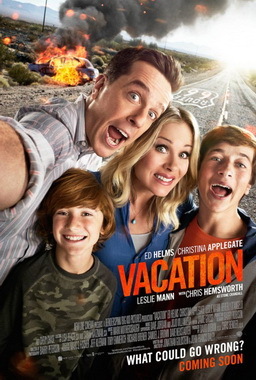 Vacation, which as the film itself points out is a sequel and not a remake of National Lampoon's Vacation released in 1983. In this film, Ed Helm plays the now grown up Rusty Griswold with his own family which he decides to take on a trip to Wally World. Something his dad Clark (Chevy Chase) did so many years ago in the original film. This in an attempt to beat back the funk in his stalling marriage and bring together a family that includes an easy going touchy feely older son James (Skyler Gisondo) and a younger son Kevin (Steele Stebbins) hell bent on torturing his old brother. The film has a lot of laugh out loud moments though its frequency and quality is lacking. As far as enjoyable moments in the movie, I particularly like the one sided brother rivalry in which James is often at the receiving end. The dialogue is sometimes witty, while at other times so absurd that even the characters in the film seem confused to each other's dialogue. While I am not a fan of Chris Hemsworth's character overall as the brother-in-law to Rusty, he does have one shining moment as Rusty and Debbie prepares for bed. The film pays homage to the original film in a number of ways such as the beautiful lady in the red sports car. But despite the various homage, it fails to properly utilize Chevy Chase and Beverly D'Angelo, making their cameo mostly forgettable. The biggest problem with the film is the pointlessness and what seems like on the fly improvisation with no real plot to keep you laughing. I enjoy Ed Helms as an actor and the majority of his movies like Hangover, Horrible Bosses and We're the Millers. And while his performance is decent here, there really is nothing to really write home about in his or Christina Applegate's performance. The constant breaking into song seems like the filmmakers were trying to fill in time instead of actually being funny and entertaining like Will Poulter's rap in We're the Millers. Despite the absurdity of the film, with dialogue and acting that will sometimes have you cringing, I actually had some good laughs from this film. Granted I wouldn't want to pay money for this film. But if you have a chance to catch it on Netflix in the future, do so. This movie for many reasons is not suitable for children. For a better road trip film, catch We're the Millers which also stars Ed Helms or the original National Lampoon's Vacation.